Betty Lou Peterson passed away peacefully, on March 28, 2018, surrounded by her loving family. Betty was born October 18, 1931 in East St. Louis, Illinois to parents William and Donna Odle. She joined brother Billy. Growing up, Betty attended schools in the East St. Louis area where she especially enjoyed Home Economics and Business Education classes. She excelled at shorthand. 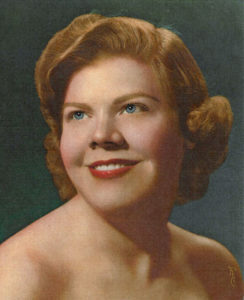 After graduating from high school, she worked as a secretary at House Chevrolet. One evening, while Betty was out dancing with friends, she was spotted by an airman stationed at Scott AFB, who was attracted to her beautiful red hair and they danced the night way. Betty married the airman, Pete Peterson, from Wallowa, Oregon, on New Years Eve. Pete and Betty celebrated 63 years of marriage together. They lived in Illinois, Oklahoma, California, Florida, Ohio, Tennessee, and finally settled in Kirkland, Washington. Through the years, they enjoyed keeping in touch with all the friends they met along the way. Betty was a kind and loving woman who will be remembered for her great sense of humor and quick wit, love of decorating for the holidays, and knowledge of classic movies. 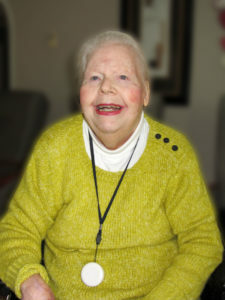 She was an avid reader, loved daily crossword puzzles, photography, cooking and crafts. Betty had quite a green thumb and grew beautiful flowers and vegetables. She also enjoyed exploring the Pacific Northwest with her husband. Betty’s family brought her great joy. She was proud to be a mother to daughter Kathi, grandmother to Casey and Kelley and great grandmother to Conner, Ella, Kayla and Ava. Her granddaughter and great granddaughters inherited her beautiful blue eyes. 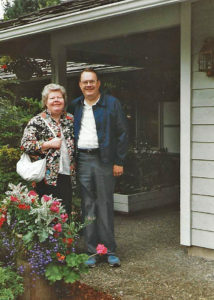 In her final years, Betty’s home was at 24/7 Adult Family Home in Kirkland, WA. Maridita and Henry welcomed her into their home and cared for her as they would a family member. She especially enjoyed singing karaoke with Henry, as well as the spa manicures offered by Maridita. Betty’s family and friends will remember her strong spirit, strength, positivity and perseverance through the years. She was a warm, kind, and considerate person and retained these qualities throughout her years of decline due to dementia. She will be greatly missed for the kind and gentle lady she was to all. Betty was preceded in death by her parents and brother. She is survived by her husband Pete, daughter Kathi (husband Kim), two grandchildren and four great grandchildren. She also leaves behind numerous nieces, nephews and cousins who were dear to her heart. A memorial service will be held April 4, 2018 at Woodinville Cemetery. Following the service, we will gather at Café Veloce to celebrate the life of Betty Peterson and all the many gifts she has shared with us.